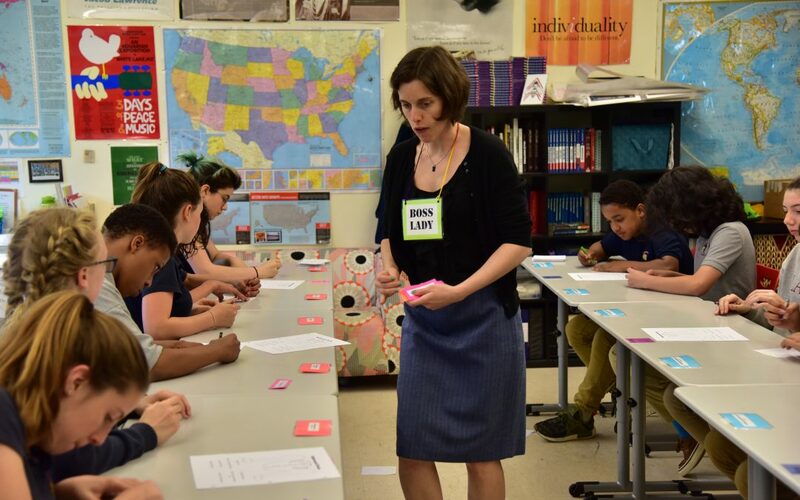 The 8th grade History simulation on the assemblyline continued this week, as students practiced designing shirt waists on an assemblyline and Ms. Coppola-Klein acted the role of Boss Lady. Real life manufacturing challenges included limited workplace quality of life (the lights went out, and the windows closed), increasing demands for speed, reduced wages, and hiring of new immigrants from the Ellis Island table to replace people who were not performing fast enough. Eventually, some students opted to strike when they felt the working conditions became unbearable. As a result, students gained insight into the experiences of turn of the century workers and the impact of industrialization and immigration or workers’ rights.